A new European Breeders’ Fund-backed £20,000 conditions race on Fibresand at Southwell this Friday, November 30, has attracted eight runners, with five rated 90 or more. The Betway EBF Buccaneer Conditions Race (1pm) over a mile and a half is one of the most valuable All-Weather races of the year at the Nottinghamshire course and includes the 102-rated three-year-old My Lord And Master, trained by William Haggas and ridden by Liam Jones, who is making his All-Weather debut. My Lord And Master ran well in Derby trials earlier this year, filling the runner-up spot in Listed races at Epsom Downs and Chester, but came home 12th on his latest appearance in Doncaster’s £70,000 Marathonbet November Handicap – a 23-runner race in which consistent six-year-old Not So Sleepy (Hughie Morrison/Graham Lee, rated 97) finished second. The strong line-up for Betway EBF Buccaneer Conditions Race on Friday also includes Corelli (John Gosden/Robert Havlin, rated 94). 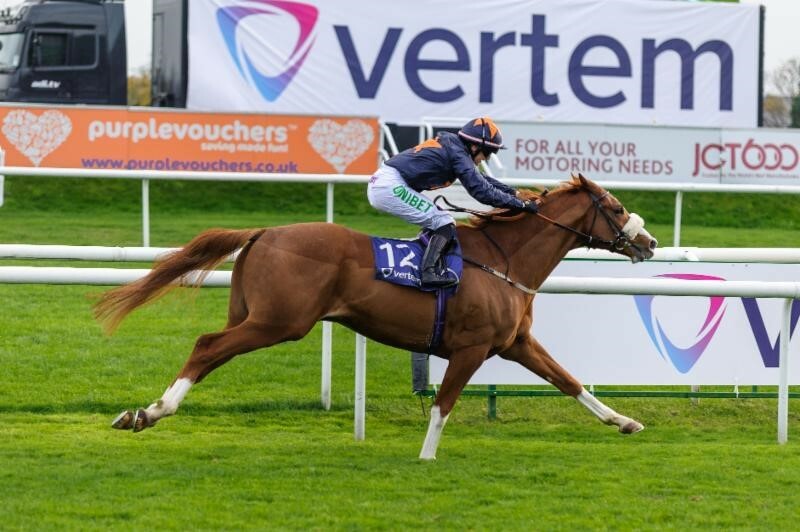 The three-year-old colt won on his only All-Weather outing when taking a Tapeta novice race at Wolverhampton 12 months ago and has his first start since finishing third in the Listed Betfred Derby Trial on turf at Lingfield Park in May. The form of that race has been boosted considerably since, with winner Knight To Behold annexing a G2 contest at Deauville, France, and the second Kew Gardens going on to G1 glory in the Grand Prix de Paris and the William Hill St Leger, the final British Classic of the year which is run at Doncaster. 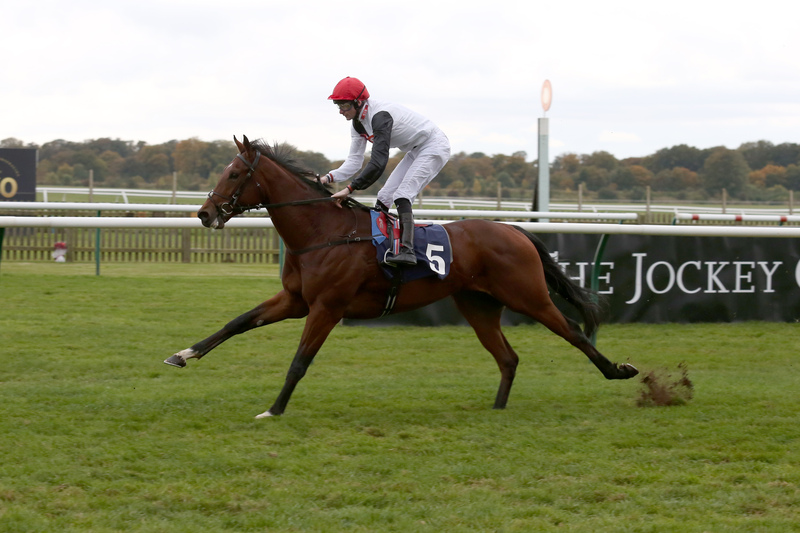 Busy Street scored over the course and distance at Southwell on his Flat debut in December, 2015, and the consistent six-year-old has won or made the frame on all six of his starts since joining Michael Appleby in May, going up 15lb in the process to a rating of 90. 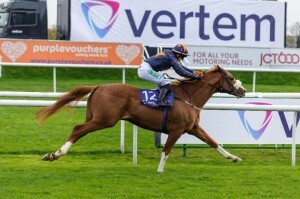 The son of Champs Elysees was the decisive winner of a handicap over nine furlongs on turf at Yarmouth in August and returns to the All-Weather after coming home third behind Morning Wonder (Kevin Ryan/Josephine Gordon, rated 92) in a 12-furlong Doncaster handicap, the Vertem Very Different Stockbrokers Handicap, on October 27. Southwell’s leading trainer Appleby, who is based near Oakham in Rutland, reported today: “Busy Street is in fine order and this race is something that we have had in our minds for a while. All-Weather specialist Victoria Drummond (Mark Johnston/Franny Norton), a three-year-old Sea The Stars filly, also boasts winning form over the course and distance, having scored by a runaway 12 lengths in the Betway Handicap on her penultimate start on November 12. Southwell and the EBF worked with the British Horseracing Authority to create this new conditions race. Mark Clayton, Executive Director of Southwell Racecourse, commented: “We are absolutely delighted with how this new race has worked out in terms of entries and runners, with some really good horses set to line-up on Friday. Rachael Gowland, Marketing & Communications Manager British EBF, explained: “The British EBF are constantly working with the BHA to pioneer new races that are felt to be of benefit to and enhance the diversity of the race programme. In common with the last fixture at Newmarket on the Rowley Mile – the Dubai Future Champions Festival – today’s Two-Year Old Day offers racegoers the chance to see the very best young thoroughbreds at the start of their careers, albeit those future stars may be a little more difficult to identify this afternoon than they were 11 days ago. Recent history tells us that the contest most likely to be a breeding ground for champions is the British EBF Novice Stakes, due off at 4.55. Three years ago it was won by CRACKSMAN (Frankel) with STRADIVARIUS (Sea The Stars) back in fourth, a pair of John Gosden-trained stablemates subsequently successful in no less than seven Group 1 races who were both triumphant at QIPCO British Champions Day last Saturday, winning the Champion Stakes and Long Distance Cup respectively. Last year’s winner, KNIGH TO BEHOLD (Sea The Stars), has also gone on to great things, scoring in Listed and Group 2 company while accumulating almost a quarter of a million pounds in prize money. Today’s renewal again promises much, with its combatants including GINISTRELLI (Frankel), sporting the black and yellow silks of Stradivarius’s owner-breeder, Bjorn Nielsen, and FAYLAQ, a son of the stallion-of-the-moment, Dubawi, and the Prix de l’Arc de Triomphe-winning mare, Danedream. 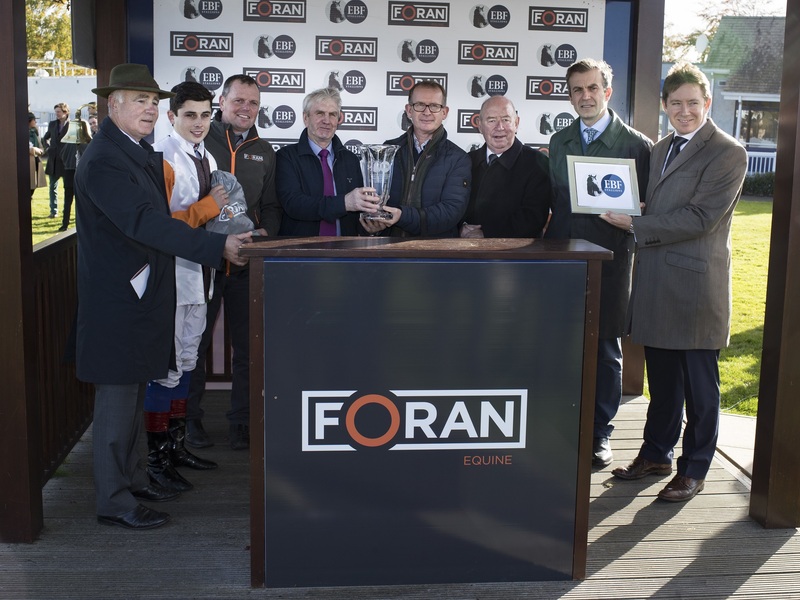 Cedars Of Lebanon capped a tremendous season for Patrick Prendergast and Ronal Whelan with an all the way success in the €120,000 Foran Equine Irish EBF Auction Race Final at Naas Racecourse. Bought for just €11,000 at the Tattersalls Ireland September Yearling sale, the daughter of Dandy Man was one of the cheapest yearling purchases in the line-up. 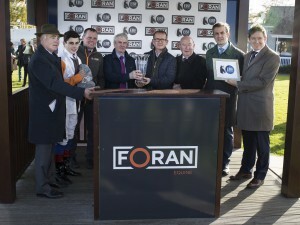 Her victory in Sunday’s final brings her earnings on the racecourse to over €100,000 having also won the Foran EBF Qualifier at Naas Racecourse in August. Yesterday’s final brought the 2018 Foran EBF Series to a successful conclusion. In total 288 horses trained by 68 individual trainers took part in the series. A full field of 16 went to post in the €120,000 Final including Lady Marengo, a series race winner at Navan in September, was the lowest priced purchase at €3,000 while Gustavus Weston also a series winner at Fairyhouse in September, was the highest priced purchase at €55,000. The average price of all the runners through the full series was €20,000. In a competitive race Cedars of Lebanon was chased home by Ken Condon’s outsider Sunblessed, while Michael O’Callaghan trained both the third and fourth home, Dark Pursuit and Pulsing Dragon. The first four home are owned by partnerships which once again showcases the Foran EBF Series as a target for the smaller owner and how it has created a platform for this segment of the market to make a significant return on their investment. SHEIKHA REIKA, the three-year-old filly by Shamardal, belonging to Sheikh Mohammed Obaid Al Maktoum won the Grade 1 EP Taylor for trainer Roger Varian and jockey Andrea Atzeni recently. 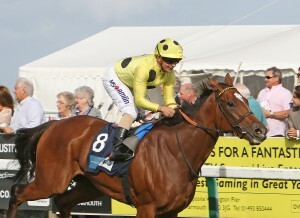 The filly has run in two heavily supported EBF races as part of her recent preparation for the $500,000, Grade 1 contest: in early September, SHEIKHA REIKA ran to a place in one of the British EBF Breeders’ Fillies’ Series Handicaps at Ascot before notching up an impressive 4 and a half length victory over stable mate RASMINA (Iffraaj) in the 1m2f Sir John Musker Fillies’ Listed race at Great Yarmouth’s Eastern Festival. 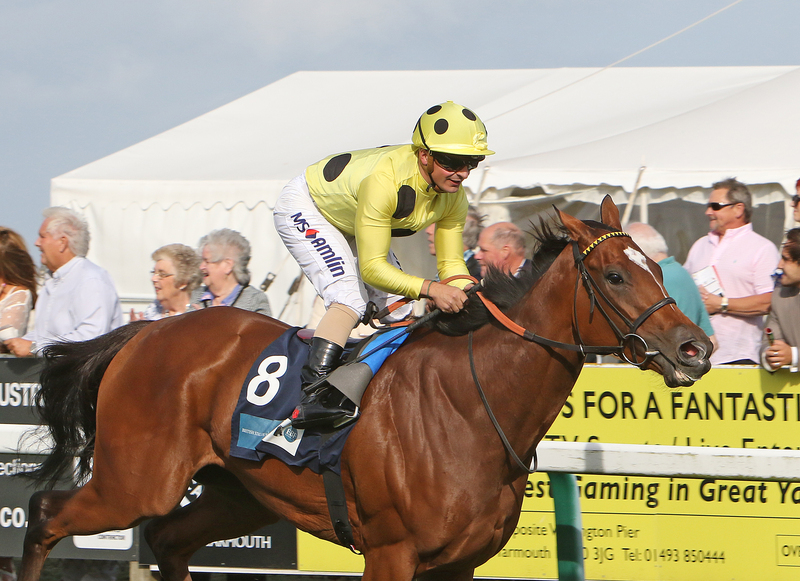 The John Musker has seen some smart performers in its long history and this season, consolidated its position as the feature race at Yarmouth’s feature meeting with a prize money boost of £10,000, brought in to being jointly by the British EBF and the course’s management. She joins the likes of SPEEDY BOARDING (Shamardal), NEZWAAH (Dubawi) and ARABIAN QUEEN (Dubawi) who have all graduated via the Sir John Musker to Gr.1 successes later in their careers.